SK Mold & Tool helps small airplanes fly. From the ground, SK Mold & Tool in Tipp City, Ohio (just outside Dayton) looks like many other large job shops. But from the air it's a whole different world. The six-building facility is situated in the middle of a scenic midwestern countryside. An aerial view reveals rolling hills, lush landscape and even a peek at the Dayton airport just a few miles away. Sam Kingrey, founder of SK Mold & Tool, knows the view well. As a pilot he frequently flies his own helicopter (an R22 Beta) the 5 miles from his house to his company. Stored at home in a specially designed hangar, the two-passenger helicopter can easily land in his company's parking lot. The experience gives new meaning to the phrase "commuting to the office." "I've always had a passion for helicopters," says Sam. "Earning my pilot's license has been one of the most time consuming, but rewarding, experiences in my life." His son, Keith, prefers to keep his feet on the ground. "Getting to work the old-fashioned way (my car) is just fine," Keith jokes. Despite their differing opinions of flight, however, father and son share another passion - machining. The duo own and operate SK Mold & Tool in the small community where both were born and raised. Keith acts as vice president/general manager; Sam is president. "I started SK Mold & Tool in my garage almost 20 years ago," Sam remembers. Armed with manual machining experience (as a tool maker) and a desire to "make stuff," the entrepreneur struck out on his own. The company he and his son created (Keith joined full time in 1984 after high school) has grown over the years - from 1,000 sq. ft. and six employees to 40,000 sq. ft. and 65 employees. Sam can't pinpoint the exact reasons for his success, but he's sure his son has been a key factor. "Between the two of us, we've tried to be good to our customers and our employees," he says. SK Mold & Tool's customers cover a variety of fields: aircraft, printing, motor manufacturing, medical and extrusion dies to name a few. Materials machined are just as diverse, from aluminum and steel to alloys, castings and a few exotics. The way the father-and-son team treat customers, however, isn't as diverse. "Each customer receives the same commitment to quality as the next," explains Sam. "It doesn't matter if it's a prototype or a long-production run; each part that leaves here needs to be perfect." Take the example of one of the company's current projects - the key components for airplane landing gears. Earning two of the five different gear design contracts is a result of the pair's dedication to quality; the owner believes. In the shop, that means devoting two Okuma machine tools (an MX-60HB horizontal machining center and a CROWN L-240 turning center) to the landing gear project, with the possibility of adding more. Buying quality tools to machine specific jobs is part of the company philosophy. "We believe in having all the tools we need to successfully machine a job. If we bid on that job and win it, we think we owe it to our customers to provide the best parts we can," Sam explains. Producing quality parts require quality machining tools. 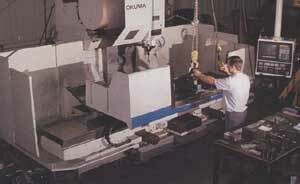 That's why SK Mold & Tool currently houses Okuma machining canters, lathes and grinders among its other CNC equipment. In addition to the two landing-gear-dedicated Okumas, the shop has two CADET-V4020 vertical machining centers, one MC-60VAE vertical machining center, one MC-6VA vertical machining center, two LB-15 lathes, one GA-34N grinder and one GA-34F grinder. In addition to CNC equipment, the company also runs a manual department complete with specialized machines to provide welding, fabricating and painting services to it's customers. The Kingreys purchase Okuma machine tools because they're more accurate and last longer than other brands. "It's nice to have a machine that's not worn-out after you're done paying for it," Sam adds. 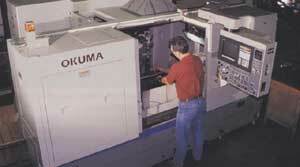 Okuma machine tools have also caused fewer problems than some of the other tools on the floor. "We've had one Okuma grinder for more than nine years," Keith notes. "I think it's only broken down once, and that was our fault." The Okuma distributor has been very responsive to questions and service problems. "It helped us a lot with the fixturing, programming and turnkey operations for our first landing gear project," Keith recalls. Hiring the right employees has been instrumental to the growth of the company, notes Sam. "To be successful in business, you have to hire people who are smarter than you. I'm not afraid to hire someone who knows more than I do about a certain type of machining; it only helps me," he adds. He also believe in giving employees person responsibility. "If you let people take a job all the way through, from designing to programming to running it, they'll take it more seriously," Keith says. The pair runs an open-book shop. Employees know how much each job costs and what profit is made. A large percentage of employees has a set of keys and is allowed to work on their own hours. The flexibility and freedom doesn't work for every shop, Sam and Keith admit, but they say it works for them because of the group of people they've hired. "We've made some mistakes along the way," Sam says. "But over the years, we've assembled a great group of people." The future of SK Mold & Tool looks bright. With growth as the goal, Sam and Keith envision diversifying their company based on "where the business is." The say competition in their area is fierce and that they often find themselves in the midst of a price-oriented society. "There is always someone willing to do it cheaper," Sam notes. "I'm convinced that if you shopped around enough, you'd eventually find someone to do it for free!" They aren't discouraged though. The owners say they do what the can for their customers on price, but they plan to adhere to their firm belief in quality. And despite Keith's stubbornness to stay on the ground, Sam's plans are still to fly high.